I moved all the fabric pieces to the background cloth to make sure that I'd be able to line them up properly. Starting with the pieces that lie closest to the background fabric, I tacked them down with small pieces of double-stick tape and used a blanket stitch to sew them down permanently. 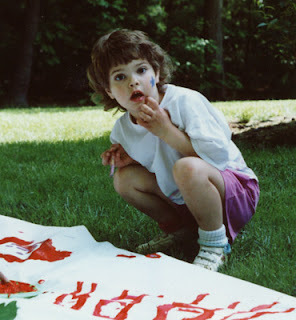 Part of the fun is figuring out which stitches you want to blend in and which will need to contrast. 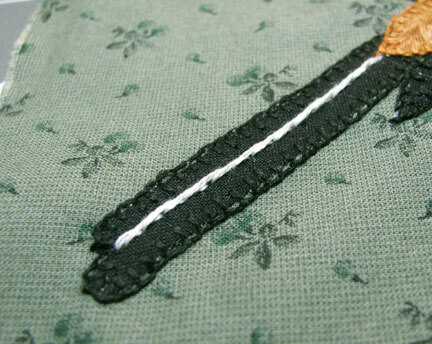 I also added a line of stem stitch up the tail at this point. In the spirit of abstraction, I decided against outlining each wing feather the way I had done in the drawing. 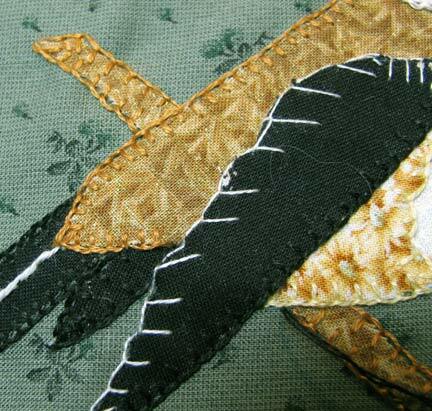 Instead, I just used a modified blanket stitch with only one strand of floss to simply suggest the feathers. Adding the eye with floss really made the bird come to life! What to do with him now? 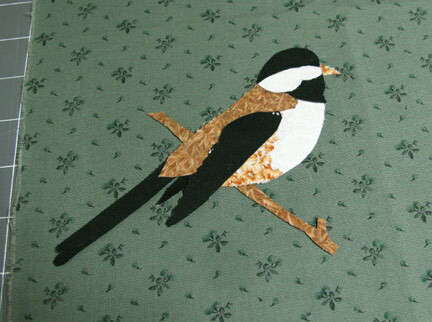 He needs to be quilted and finished off, but I'm wondering if I should just hold onto him and make some more bird friends for him before I start quilting. This little square is only about 6x6 inches. What do you think? One square in a larger quilt, or one teeny little quilt on its own? He's so good looking, I opt for a little quilt on its own to showcase the bird. So sweet! I love the detail on the bird! He is lovely! 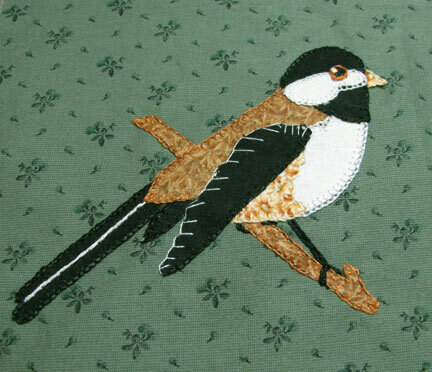 If you opt for the little individual quilt, he could be the first of a series, or not, and then you are under no pressure to make him any feathered friends. He did turn out so nice!! You know of course I just love the birds & butterfly's so I've been quite interested in your progress! Just lovely, I'm a bird person myself. Working on a bird theme altered book. Teeny quilt on its own. 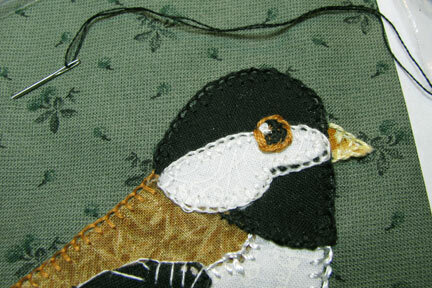 I would want to show off the beautiful stitch work and make the cute little bird the focal point.